Cooked chicken breast in gravy with roast potatoes, peas, baby carrots and a sage and onion stuffing ball. Succulent chicken breast with gravy, roast potatoes, peas and carrots. A convenient frozen ready meal, ready in the microwave or oven. 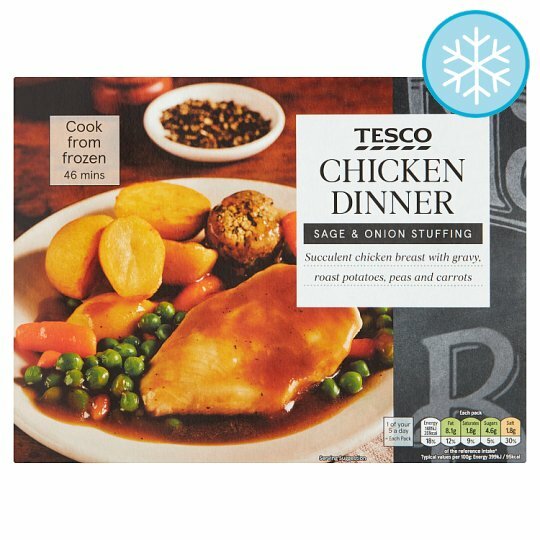 INGREDIENTS: Chicken (24%), Potato, Water, Peas (11%), Baby Carrots (11%), Sage and Onion Stuffing Ball [Water, Wheat Flour, Onion, Oats, Salt, Rapeseed Oil, Sage, Parsley, Yeast], Cornflour, Sunflower Oil, Butter (Milk), Yeast Extract, Wheat Flour, Sugar, Salt, Flavouring, Chicken Fat, Caramelised Sugar, Chicken Extract, Sage, Thyme, White Pepper. Instructions: For best results oven cook from frozen. Remove outer packaging and make a large slit across the top of the plastic wrapper. 200°C/ Fan 180°C/ Gas 6 46 mins Place on a baking tray in the centre of a pre-heated oven for 25 minutes. Stir gravy, and turn chicken over. Heat for a further 20 minutes. Leave to stand for 1 minute after heating. Remove stuffing ball and roast potatoes and place to one side. Stir gravy, turn chicken over, and return the stuffing ball and roast potatoes to the tray.